Meet Dr. Copper Aitken-Palmer. Aitken-Palmer joined the Brookfield Zoo team in May 2016. She is world-renowned for her work advancing reproduction in giant pandas, a species that, with the help fo science, is no longer considered endangered. Q: Let’s start with how you first became interested in animals. A: I cannot remember a time when I didn’t want to work with animals—even though I was allergic to them when I was young! I read National Geographic magazine and knew I would pursue a career somehow focused on wildlife. A: My job would be easier with a limitless flow of support from the human race and compassion and concern about all endangered animals, not just the iconic species. My colleagues and I were successful in boosting giant panda populations in part because conservation programs for them ere highly funded. It was a priority. To drive success comparable to giant pandas, we need individuals, governments, and others to help support similar efforts for other species—salamanders, penguins, and frogs for example. 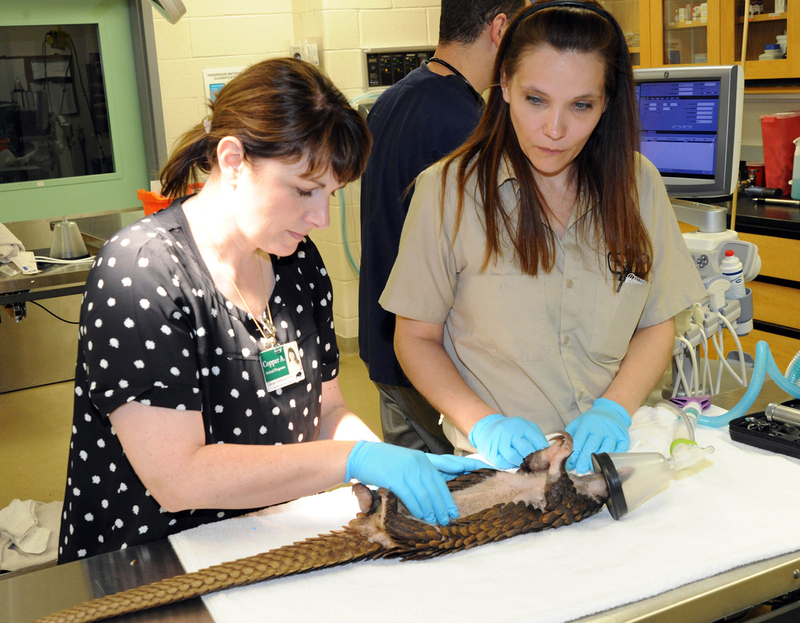 checkups to pretransport wellness assessments in cases where animals are leaving our zoo for another zo. The species I work with range from hour to hour—at 11:00 an okapi, at 12:00 a penguin, at 1:00 a reindeer calf. It’s never dull! Q: What happens during an unusual day? 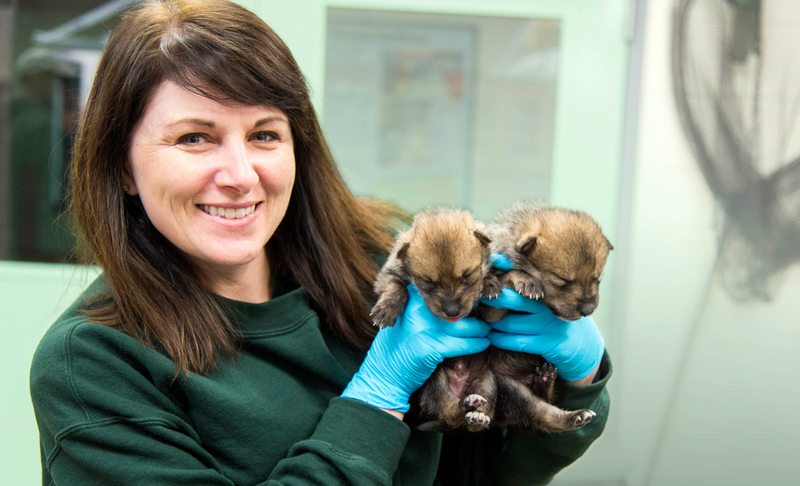 A: With very little notice, I may be called on to travel along with animals being transported as I recently was with our Mexican wolf pups relocating as part of our wolf recovery program. Things that are abnormal to most people are normal to me. I work many weekends and holidays. I may bet a call that a screaming hairy armadillo needs an exam. One of my favorite parts of the job is visiting with animals when they are feeling well, like when I have a bit of downtime and can just visit with the dolphins here at Brookfield Zoo. Q: What is it about working here at Brookfield Zoo that you find especially enjoyable? A: This team is really special. Our leadership has a vision to move zoo medicine to the next level, and we are the only zoo I know of with this emphasis. It’s important to me to feel as though we are making a difference. The Society has a long history of working on species survival and is a pioneer in the veterinary care of a imperiled species such as pangolins—animals that science knows relatively little about but will be lost to us forever unless we do something to save them. A: As a veterinarian interested in the conservation of endangered species, I am proud that my work helped giant pandas to be downlisted—in other words, to no longer be considered endangered. It was a career highlight to have been part of a team that drove major scientific and conservation advances for this species. We progressed from not knowing very much about the animals to fostering science-driven reproductive success and boosting dwindling populations. In my field, it doesn’t get better than that! I hope to repeat this achievement with other endangered species. This article originally appeared in Gateways, Brookfield Zoo's member magazine.